Having won great acclaim at the likes of the Mariinsky, Bolshoi and La Scala, director and set designer Dmitri Tcherniakov has arrived in the capital with a reputation for restyling the classics. 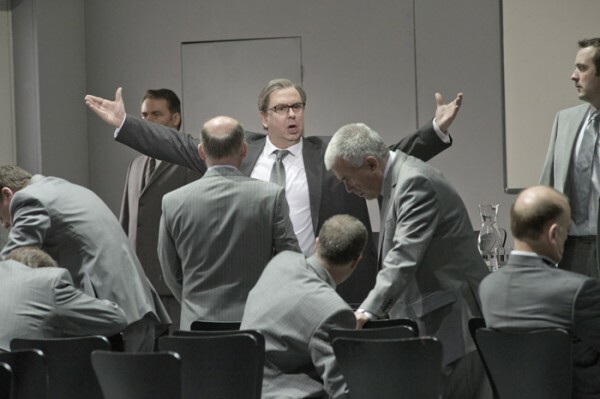 He now turns his hand to Verdi’s Simon Boccanegra at the ENO, where he is joined by conductor Edward Gardner and video designer Finn Ross. Like much of Verdi’s later work, the plot of Simon Boccanegra is a complex affair. Finding himself transposed from medieval to mid-twentieth century Italy, Boccanegra (Bruno Caproni) is a pirate mourning the death of his illicit lover and the disappearance of their child (Rena Harms). Persuaded by the Plebiscites to stand for office against the ruling Patricians, we rejoin the autocrat twenty-five years later as he seeks to exact his revenge – most notably upon his lover’s father and old foe, Jacopo Fiesco (Brindley Sherratt). Things get complicated when his estranged daughter remerges and conspires to get kidnapped by all parties. There are great and frequently implausible leaps in the story between acts, but Tcherniakov at least is merciful. Each scenario is introduced by a paragraph or so of projected exposition, something that at once aids comprehension and locates the production on the cinematic register. It seems fitting then that the curtain parts to reveal a stylised diner and piazza at night – Genoa as Edward Hopper might have painted it. The design at this point is impressive and excites with its scale and rendering of depth. As an image, it becomes a touchstone for the entire work; having witnessed the trauma and intrigue that established Boccanegra’s despotic rule, the image of the town square reoccurs as the leitmotif of his sorrow and regret. It returns later in the proceedings, projected onto another, entirely different tableaux as the pirate squares up to his future – an example of the astonishing video effects that have so embellished the look of Tcherniakov ‘s production. Yet for all the gravitas the opening set lends the prologue it surrounds, it appears only here in concrete form. In contrast, the stage dressing from the first act onwards is compressing, minimalist, glaring, and a touch cliché. We are presented with the banality of power – with government by boardroom and whiteboard. Space is partitioned and obscured, doors and windows open and close like barometers of growing tumult; both submission to and the wielding of power become linked to the repression of free movement, a dynamic that Boccanegra himself is unable to escape. This is an interesting but problematic characterisation of the Doge. To a degree, Tcherniakov has thrown the pirate out with the saltwater – presenting us not with a vicious old seadog yearning for the ocean, but with a bedraggled bureaucrat in slacks and spectacles. The metonymic power of his piracy is thus weakened, and there is scant evidence of the extra-diegetic tyranny alluded to in the surtitles. As a result, the close of the opera fails to move as it perhaps could, and the final image of Boccanegra losing it in a newspaper tricorne doesn’t really add up. Performances and elucidation throughout the show were of a very high standard. Sherratt and Caproni flourished despite the lead males’ roles being in the lower registers, balanced wonderfully by Harms’ soprano and Peter Auty singing tenor. It would have been satisfying had Tcherniakov used these distinctions to make greater play on the class issues that provide a background to opera. Boccanegra’s baritone sounded far less stately and wise than Fiesco’s bass, and youthful vigour, in the end, overcame all obstacles. Cast includes Peter Auty; Bruno Caproni; Judith Douglas; Rena Harms; David Newman; Mark Richardson; Brindley Sherratt; Roland Wood.